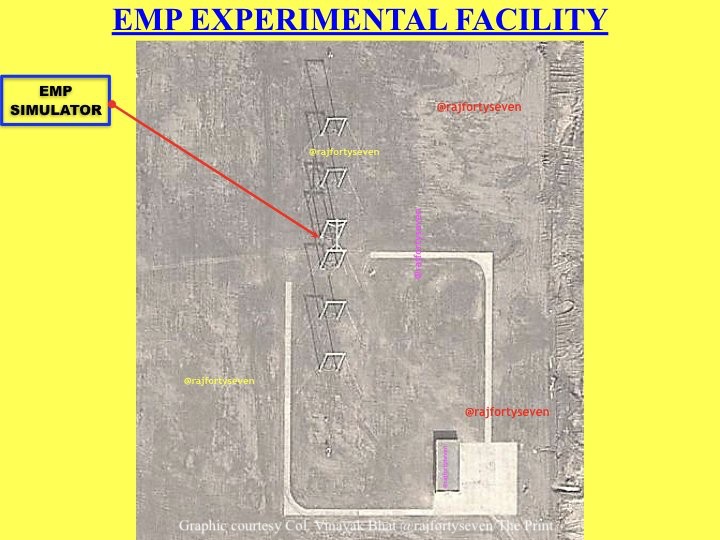 Commercial satellite images have provided the first photographs of a secret Chinese anti-satellite laser base in western Xinjiang province, along with other high-technology weapons facilities. The laser facility is located near a lake and is about 145 miles south of the Urumqi, the capital of Xinjiang. The facility was discovered by retired Indian Army Col. Vinayak Bhat, a satellite imagery analyst who specializes on China. China is using its satellite tracking stations located throughout the country as a means of identifying and targeting satellites. "Once the accurate satellite path and other data is known, directed energy weapons located at five different places can take over the task," Bhat said. 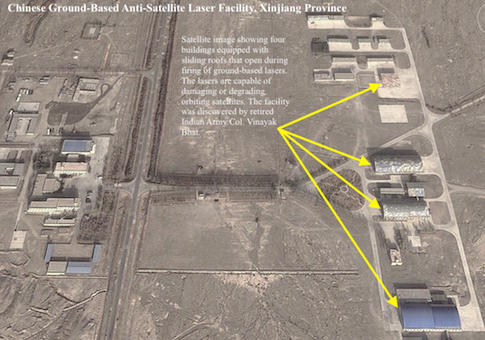 The Xinjiang base is one of those laser bases that include four main buildings with sliding roofs that Bhat assesses contain high-powered chemical lasers powered by neodymium. Bhat estimates that the smaller shed with the sliding roof is a laser tracker. Taken together, the Chinese can fire one to three of the lasers against an orbiting satellite that China is seeking to disrupt. The Defense Intelligence Agency stated in a report made public in February that China is set to deploy a ground based laser cannon next year. The report said Beijing "possibly already has a limited capability to employ laser systems against satellite sensors." "China likely will field a ground-based laser weapon that can counter low-orbit space-based sensors by 2020, and by the mid-to-late 2020s, it may field higher power systems that extend the threat to the structures of non-optical satellites," the report, "Challenges to Security in Space," says. The DIA said directed energy weapons can be used to "disrupt, damage, or destroy enemy equipment and facilities." "These weapons, which can have effects ranging from temporary to permanent, include lasers, high-power microwaves, and other types of radiofrequency weapons," the report said, noting the difficulties in identifying the source of such attacks. It is not known if the Xinjiang base was the source of the well-known laser illumination of U.S. reconnaissance satellites several times in August and September of 2006. The laser "painting" occurred as the satellites passed over China. Then-Director of the National Reconnaissance Office Donald Kerr said at the time that the laser illumination did not damage the satellite's ability to collect information. The 2006 incident was believed to be tests of ASAT targeting since the illumination was assessed to be from a low power laser beam. Ian Easton, a China analyst at the Project 2049 Institute, says the United States is vulnerable to Chinese ASAT weapons. The United States operates nearly half of the 270-plus military satellites in orbit, as well as hundreds of civil, commercial and dual-use satellites that can be used for military operations. "China has also apparently tested and deployed at least one large, ground-based ASAT laser weapon for use on a number of targets in [low-earth orbit], and is developing a submarine-based ASAT missile with which it could eventually target U.S. national security satellites in [geosynchronous orbit," Easton said. China has claimed in military writings that it successfully blinded a satellite with a laser in 2005 using a 50 to 100 kilowatt mounted laser gun fired from Xinjiang. A report by the Center for Strategic and International Studies identified lasers like those in China are non-kinetic counterspace weaponry. and more difficult to attribute," the report from April 2018 says. "High-powered lasers can be used to damage or degrade critical satellite components, such as solar arrays. Lasers can also be used to temporarily dazzle or permanently blind mission-critical sensors on satellites." To blast a satellite from earth with a laser required a focused beam, adaptive optics, and advanced pointing controls that steer the laser beam as it is fired through the atmosphere. According to the CSIS report, a laser attack can damage satellite sensors within the field of view of the sensor and that is the key to attributing the source of ground-based attacks. For those using lasers to attack satellites, it is difficult to determine the damage since the laser's impact on the sensors and other electronics may not provide debris or physical indicators. 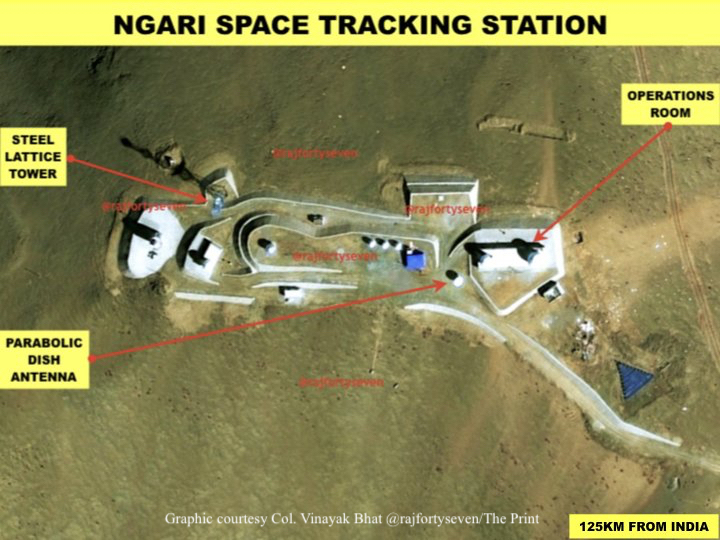 Bhat also disclosed the locations of other facilities in China used for exotic weapons systems, including an electromagnetic pulse facility in Xinjiang. 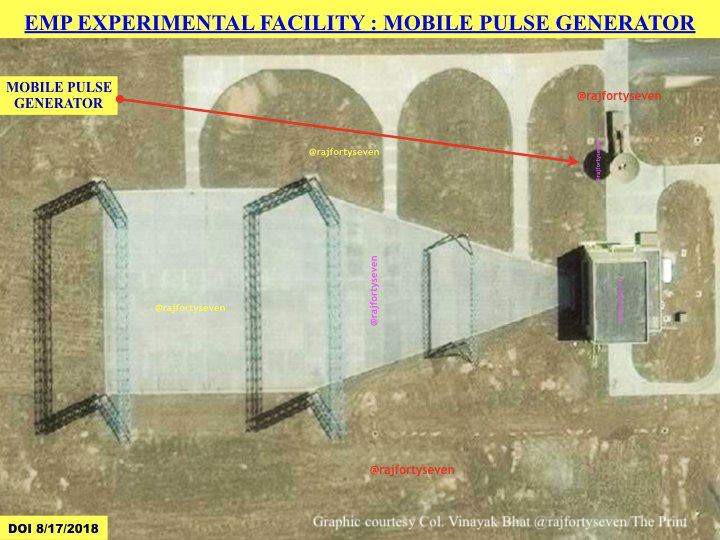 Photos of the location showed what appear from space to be an EMP simulator. EMP is the pulse produced by a nuclear blast or solar flare that can disrupt electronics for thousands of miles. The photo shows a road leading in to the facility under a cylindrical EMP generator that can illuminate equipment and vehicles with EMP. "This facility is used for researching methods of hardening Chinese military equipment and reverse effects on adversaries’ equipment using electronic components," Bhat says. Also in Xinjiang is a mobile pulse generator—an electronic warfare system used to create electromagnetic interference that can disable satellites. China's satellite tracking capabilities also have been greatly increased in recent years. One was photographed at Ngari, Tibet. The facilities were first disclosed in the New Delhi news outlet The Print.